“Final” Final Friday of 2013! Final Fridays began in August of 2010 through the cooperation of the Lawrence Arts Center, Downtown Lawrence Inc., The Lawrence Cultural Arts Commission and a wealth of artists, gallerists, art collectives and local businesses, all of whom saw the value of the arts in our city and an opportunity to bring them to a wider public through this monthly free arts festival. Lawrence has one of the highest percentages of working artists in the country per capita, and has long stood out in the Kansas landscape as a mecca for creative thought and energy. On the last Friday of every month (all year long!) 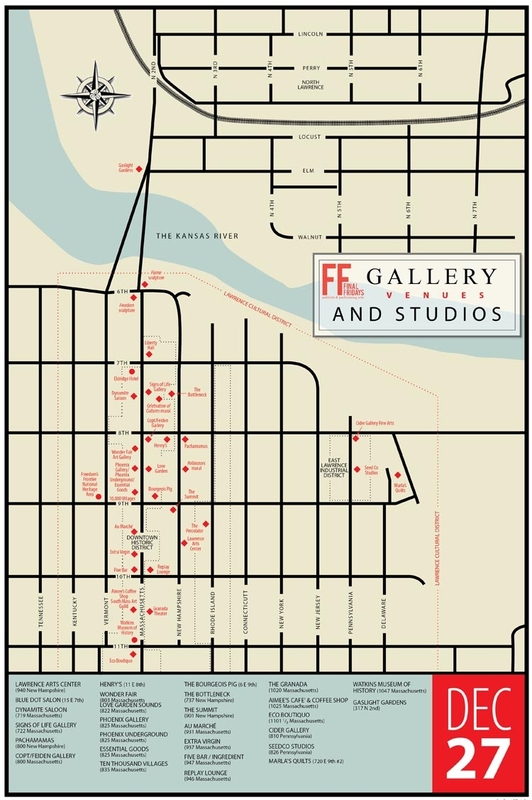 from 5 until 9 pm, the streets of Downtown Lawrence erupt, storefronts convert into flash spaces, and performances and exhibits spill in and out of galleries and businesses. Activities for kids, exhibitions designed to challenge adults, music, dance and theater for all ages are all within walking distance of each other. The Bottleneck, Lawrence’s Rock and Roll historical music venue is excited to join local artists, art collectives and local businesses for the Final Fridays Art Walk. Final Fridays take place in downtown Lawrence on the last Friday of each month from 6 to 9pm. Kelly Kearns is an artist, a rock collector, and an aspiring herbalist. She received her BFA in printmaking from KU in 2009, and still lives in Lawrence. She explores nature in her artwork with color, shape and detail, always thinking of the macro vs. micro tricks the great outdoors can play on you. Molly Murphy is a painter working out of her studio in the Crossroads Arts District in Kansas City, Missouri. Her work investigates memory in many facets, from the forgotten to the manipulated, from the intuitive to the documented. Her work has been exhibited in solo and group shows in Lawrence, Kansas City, Dallas, Portland, Des Moines, Tulsa, Los Angeles and Amsterdam. She has created special projects on memory for exhibitions at Baker University in Baldwin, Kansas, BNIM Architects in the historic Power & Light Building in Kansas City, and for The Escape to Create Fellowship in Seaside, Florida where Murphy was the 2012 Visual-Artist-In-Residence. She is currently serving her second term on the Board of Directors of the Lawrence Arts Center and coordinates the Final Friday Art Walks in Lawrence, Kansas. This exhibit is a collective body of work I have created over the past year while sitting at my table in front of a large wall made of raw brick. When creative “presque vu” would hit, I would often find myself staring intently at the wall as if the textures and colors would give me the inspiration I was looking for. Like a word caught on the tip of the tongue, these pieces are my attempt to find the right answer to the creative questions I have been asking myself throughout this past year. Inspired by both National Geographic photographs and naturally found objects I have personally collected, these pieces demonstrate my various experiments in form, material, and matter. Alycia Futrelle, a Kansas native, earned her BA in Art History from the University of Kansas in 2010. With no formal training, most of her experience comes from personal projects and experimenting with various media in her spare time. Her past works include mixed media, collage, and photography as well as hand drawn and water colored images which explore organic and geometric forms. For this month’s Final Friday Art Walk, Phoenix Gallery is teaming up with Essential Goods for a special night of teapots and tea. Stop by to see a display of teapots handmade by our wonderful artists. Both functional and decorative, these pots are made to be used and enjoyed. Then head downstairs for a lovely cup of blended tea (also sold at Essential Goods) while having some cake. It will be an evening to unwind between holidays! Phoenix Gallery will also show the ceramic work of Carl Brothers. He is also the featured artist in Phoenix Underground. Come and meet this multi-talented Kansas artist. Leon Ault’s photography will be in the New Hampshire St. entrance. The local band Lost and Found with be here to provide music. Carl Brothers has taught art in high school for 36 years. During that time he took classes in pottery and painting. He has now moved back to his hometown of Cherryvale, KS and is teaching there. Carl has exhibited his pottery in art shows around the Midwest and has had his work at Phoenix Gallery for many years. As he nears retirement, he thinks more in the terms of painting. Leon Ault is a native Kansan and nature lover; he is a cinematographer and documentary film maker. While that career has given him the opportunity to travel to places that people traveling for pleasure seldom get to experience, he always loves returning to Kansas. For December’s Final Friday Art Walk at Phoenix Underground we will feature artists Maria Martin and Carl Brothers. Maria Martin’s mixed media paintings create journeys through the use of textured surface layers and the colors so important to her work. She draws her inspiration from her travels and her childhood working alongside her artist father in his home studio, her private art school. Through abstract expressionism the viewer is drawn into the work—feeling the air, seeing the imagery, and sensing the emotion as each painting becomes their own story. Maria studied art in Philadelphia and at The University of Kansas in Lawrence, where she now resides. Please join us Friday, December 27th at the opening reception for Lawrence artist Jeff Weinberg. We will be showing a new series of Jeff’s paintings titled “Visions & Wired”. It will be a fantastic evening and we look forward to seeing you there! In the paintings of Jeff Weinberg one can find visions of his native Kansas, or works inspired by travel around the world or masterpieces of literature and music. His work is found in galleries in the United States and in Asia, in one museum and in private collections. Erok Johanssen is a Visual Artist from Lawrence, Kansas. He currently works as a resident artist at Lost Art Space. Erok got his start in the streets as a graffiti artist. Graffiti opened him up to a variety of creative outlets. Mixed-media, Photography, and Graphic Design are the areas Erok is currently producing the majority of his work in. He is a member of the long standing Fresh Produce Art Collective. As a member of FPAC, Erok plans to continue exploring new and exciting methods for creating visual chaos in a harmonious way. And drink some whiskey in the process. Using cryptozoology as an allegory for legendary individuals, animals and the act of story-telling, this exibition will be a celebration of cryptids, whose existence is often passed down through oral tradition, stories that are embellished, can’t be authenticated, or are just too weird to be believed (or denied). For this exhibition, the artists have collected numerous reports of legendary beasts, enigmatic people and strange happenings from writers and community contributors. These stories are the source material for original pieces of art showcased in the SNIPE HUNT exhibition. Kent Smith is an illustrator, designer and all-around artist extraordinaire. A graduate of the University of Kansas with a BFA in illustration and design, Kent gets to spend his time making pictures—something he celebrates daily. Made from many mediums, Kent’s artwork is chock-full of humor and personality. He is always up for a new challenge. Kent loves robots, ninjas, super-heroes, monkeys, ray-guns and romance. Matthew Lord graduated with a BFA in illustration from the University of Kansas and is a commercial illustrator/designer and fine artist. Matt’s artwork tilts toward the absurd, with a healthy dose of pop culture critique. He strives to tell a well-constructed story with his artwork, using the panel as his delivery device. Matt’s influences are drawn from a youth saturated with comic books and toy commercials—he still holds out hope to someday get the G.I. Joe Aircraft Carrier. Cider Gallery Fine Art is excited to present a group exhibition for the December Final Fridays reception. The gallery will feature works from a selection of Cider Gallery artists, including works from artists Nina Irwin, Clare Doveton, Tim Forcade, Stan Herd, Jeremy Rockwell, John Sebelius, and Hunt Slonem. Cider Gallery is located at 810 Pennsylvania in the Lawrence Warehouse Arts District, and the reception will take place on Friday, December 27 from 5:00 to 9:00 pm. The Cider Gallery Bar will also be offering a special selection of beer and wine. For more information, contact art@cidergallery.com or visit cidergallery.com. Located within the Warehouse Arts District at 826 Pennsylvania in a monolithic brick warehouse, this space is ideal for making, showing and engaging in all aspects of contemporary fine art. With studios on the lower level and event space in the main hall, the potential for creating and collaborating on projects at all scales is practically limitless. SeedCo is envisioned as a creative factory/laboratory with each of the resident artists bringing their singular artistic identity and prowess to expand and delve deeper into conception and production. At the heart of this project is a conscious intent to transform post-industrial space into a fluent medium all its own, specifically designed to transcend temporal and spatial values and condense them to create a heightened sensory experience. A multi-disciplinary approach emphasizing cooperation, collaboration, and community involvement and encompassing elements from fine art, sculpture, graphic design and production, fashion, construction, digital media, and street art, the scope of this endeavor is far-reaching, but the flavor is distinctly home-grown. With its placement in the center of historic redevelopment, directly behind the monumental Poehler building, SeedCo Studios has the chance to act as a catalyst for creative growth, not only in Lawrence proper, but radiating outward into the surrounding regional area and beyond. Not your typical on-the-prairie quilter, Ms. Jackson brings her African American heritage and historical creative poignancy to her quilts. Her primary goal with her work is to echo the untold stories of heroes that history has overlooked, forgotten, or hidden. But it is not until you know the raw emotion of Ms. Jackson’s personal story, that you see the joy and pain of her own life intertwined with her African American culture playing out in the brilliant color and texture in her “story” quilts.